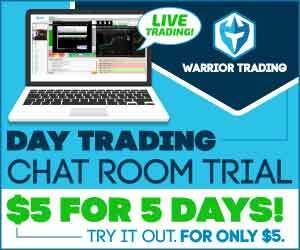 Made +$5,399 Trading These Stocks! What’s up everyone? Alright. 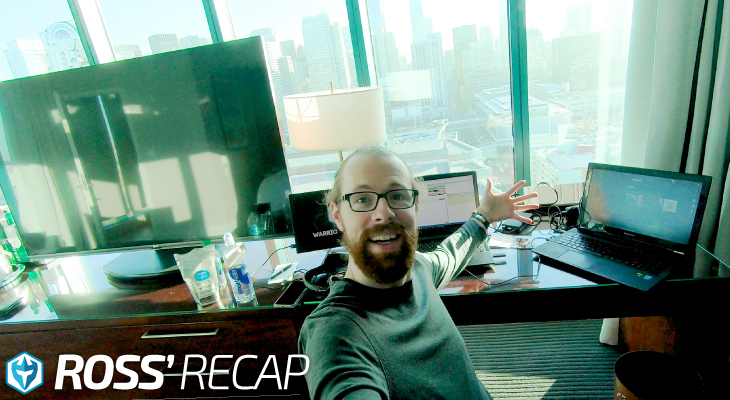 Here we are finishing up Wednesday morning up $5,399, another green day of trading and it puts me about $16,000 on the week, which is awesome. Up around $70,000 on the month. We still have about two and a half weeks left this month and my target is still $100,000. Remember, half of those profits are getting donated, so I really want to make as much as I can this month because it will mean more money that I can give away. If I have my best month ever and I break $117,000, I’m going to feel like it’s just totally meant to be and that’s kind of still back in my mind it could happen. Remember, we started this month with two back-to-back $29,000 days. Boom, 60 grand. If I have two back-to-back $20,000-$30,000 days sometime in the next two weeks, this is going to go from a $70,000-$80,000 month to a $130,000-$140,000. It’s possible, so right now it’s just a matter of being patient. Waiting for the moment, waiting for the opportunity and then when I see it, striking on it. Today, I had a couple really good trades. BLNK, gave back like $500 on that. That one wasn’t as good, but did well on GEMP and IHT. 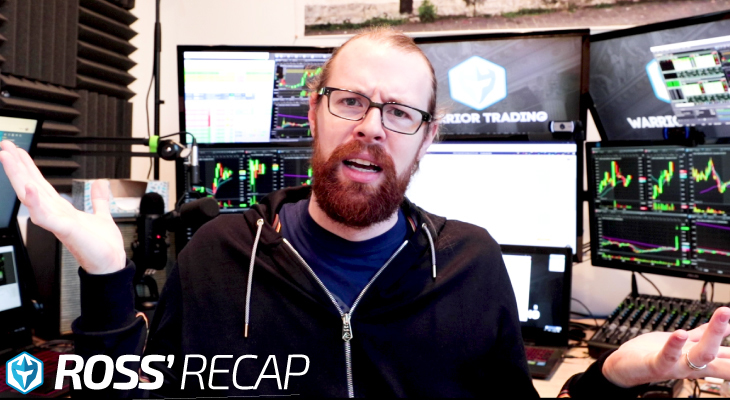 We’ll break down all of today’s trades in today’s midday market recap. Alright everyone. Here we are finishing the morning up $5,399.35. Another green day of trading. Not bad at all. Today, I had some pretty good profits and I gave a little bit of it back. I pushed a little harder than maybe I needed to. I was up about 7,500 and then I had two back-to-back losses, so I gave up a little bit of those gains, but you know what? Being aggressive is the reason I’m up even as much as I am now. $5,000 is still an awesome day of trading. Puts me up, geeze, let’s see, right around $16,000 on the week. Not bad at all, I’ll take it, so $16,000 on the week. On the month, am I breaking over $70,000? Gosh, I must be close. $69,870 on the month. This adds another $2,600-$2,700 of profit that’s going to get donated to charities this month, which is awesome. Half of my profits are going out to various organizations for the month of May in honor of Memorial Day. That is about $35,000 as of right now and the goal is still $100,000 of total profit, so I can give away $50,000. We’ll see if I can get there. We still have, let’s see. Well, we still have two full weeks of trading, two and a half full weeks of trading just about. I mean, there’s still hope, but we definitely need to see good momentum. Today, was decent. I mean, it was really not bad at all, but we started to see a little bit of choppiness as we got further into the day. That was something that I wasn’t happy to see and it made me a little more inclined just to take my profits and call it a morning kind of after 10:00 AM. To break down the trades from this morning, let me pull up my eSignal charts. BLNK was the one we were watching out of the gates and we knew it was going to be difficult because of the fact that even though it was gapping up a lot and in a lot of ways it looked really good, it was also really extended coming into the open. As it squeezed up here, had a pre-market high of 743. The bell rang and as you can see it started just sort of a little choppy, popping up, dropping down, popping up. I took a trade on it, getting in with 2,500 shares at 739. Ended up getting stopped out of the trade … Well, I sold half at 748 and then the rest at 746 and then the rest at 711, so I lost $7.00 on that first trade. Down seven bucks. Alright, got back in at 737 as it surged back up, so I’m sort of in right here and then back in here. Long at 737, 39 and 50 and then it pops up. I sell half at 54, sell the rest at 49, 48. It just didn’t really work out that well. It kept popping up and dropping back down, you know, popping up and dropping back down. That type of action, that choppiness is very difficult. 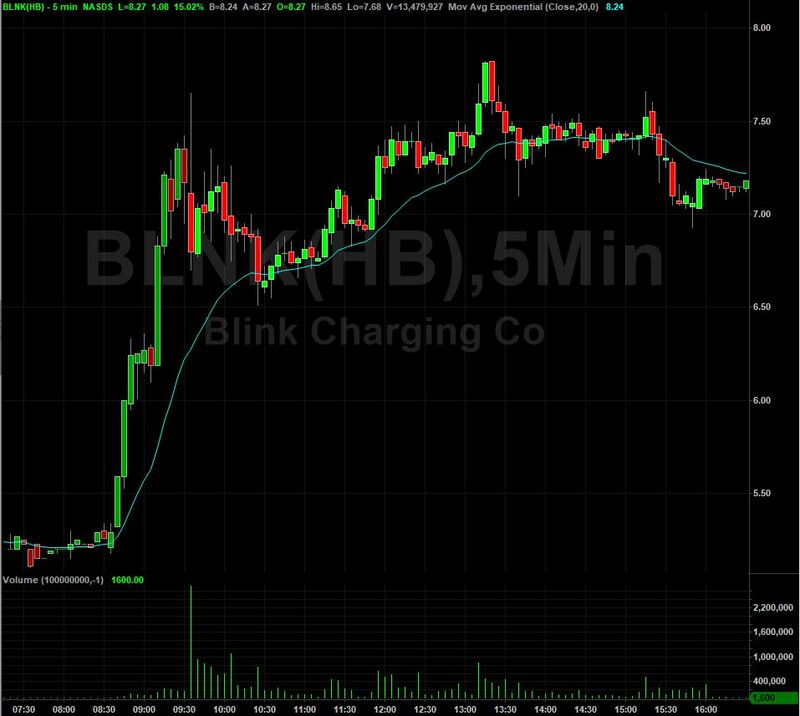 Right out of the gates I was up actually about $500 on BLNK on those two trades, 560 bucks or so. Then, we had GEMP hit the scanners. 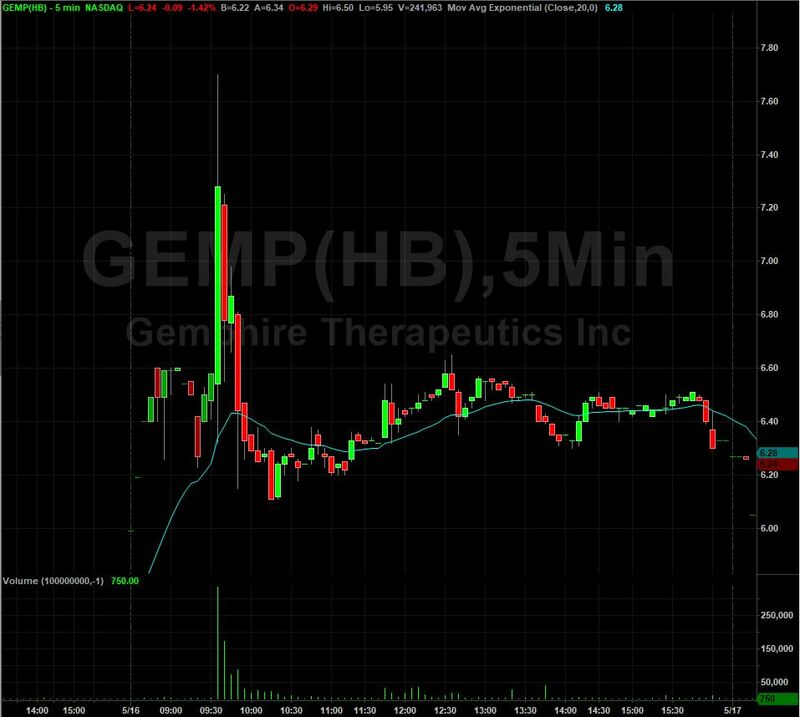 Now, GEMP was on our watch list this morning. 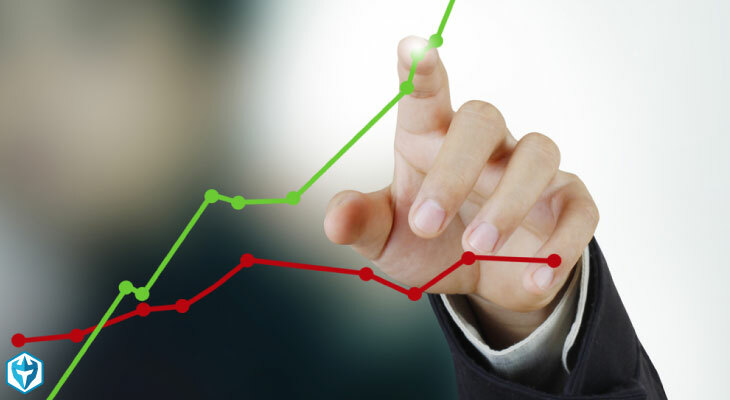 There was news out and we were watching it over the pre-market high of 660. The bell rings, it starts to squeeze up, I see it and I jumped on it as quickly as I could. Did a little red to green move and dipped down and then surging through the open. I jumped in at 685 and added at 699, so I had 10,000 shares and it popped up to 721, I sold half and I got filled immediately at 721 and 723, like $3,000 profit. I mean, it was like an instant. I then added back at 762 thinking that this was maybe going to continue higher and go into a circuit breaker halt. It hit a high of 770, but then it dropped back down, all the way back down and I stopped out as it came back down giving up a little bit of profit. Selling the rest at 717. I was up a little over 4,000 on this one, but then ended up finishing up $3,794, which is not bad. I mean, that’s a great trade, but I was being a little aggressive thinking maybe it would continue. I knew the 200 moving average was here on the five-minute on the daily chart and that could be a problem. We kind of tapped that level and faded off of it, so that may have been the issue there. Quick little trade on that one. Oh, and then BLNK, I guess I was still holding some of it while I was in this trade and I stopped out of it at 679. You can still how it did this really sharp drop here and so I stopped out as it dropped back down. It was only 163 shares I was still holding, so I guess I didn’t really matter that much, but gave back a little on that. Then we had IHT hit our scanner. 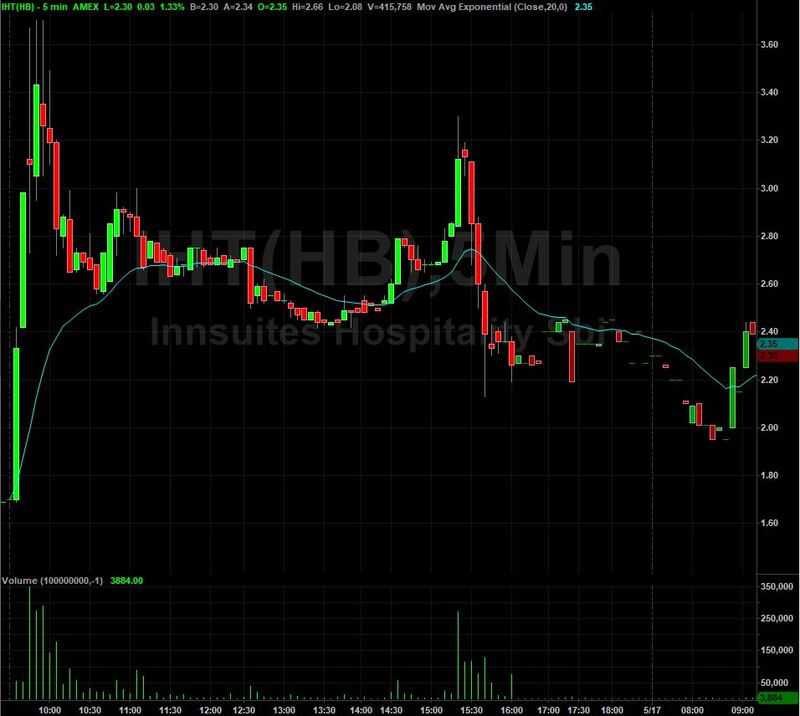 IHT was a stock that popped up on the scanners. Let’s see, came up right here at 230, 38, 39, 42, 41, 44. It’s popping on the scanner and I’m like, “Okay, this one is surging up, I’m going to jump in, try to ride the momentum.” I jumped in at 275 and I was adding … I guess I started adding at 260, 65, 63, 69, added at 91 and 90. It’s then halted on a circuit breaker and I have about 10,000 shares. It resumes. I try to add at 302, I don’t get filled. Added at 324. Tried to sell at 333, didn’t get filled. Sold on the bid at 327. It then drops down to 299 and I stop out because it’s selling off. I gave back some of … Well, you know, some of these gains here I guess maybe I sold them up three cents, but it kind of dropped back down here and then it surges back up and I get back in at 326. It pops to 344, 349. I’m selling, adding back at 349 and then I stopped out of that at 321 and 313. Again, giving back a little bit of profit between those trades and when you look at the chart you can see it surged up and then did this final top at 67 and then dropped back down. As it dropped back down here, that’s where I ended up stopping out. It then curls back up and I get back in at 370, literally adding at high of day and having to stop out at 359 and giving back a little bit of profit there. On this one I was up by $2,800 and I gave back about $700 being a little bit too aggressive. Alright? I wish today maybe had held up a little bit better and I could have finished up 7,500 or maybe up closer to $10,000, but hey, 5,500 is good and again, when we’re talking about $5,300, $5,399 times 225 trading days in a year, that would be 1.2 million dollars, so if you can have a $5,000 day consistently, you’re killing it. The reality is you’re going to have days when you make 5,000, then you’re going to have days where you lose a little bit of money. There’s kind of that ebb and flow, but right now we’re still definitely in a hot streak. 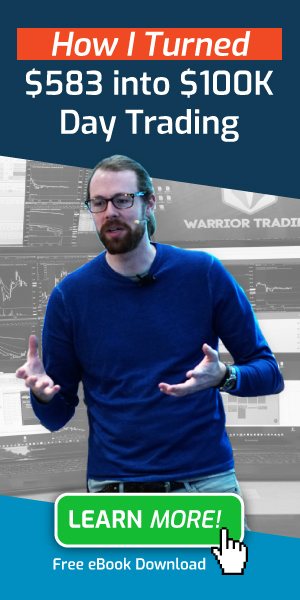 I’ve been averaging, let’s see, today is the 87th day of the year and I’ve been averaging $3,146, so $3,146 times 225 trading days in a year puts me at 707,000 on the year and my goal is 665,000. I’m tracking a little bit above my goal if I can keep it up and I’m hoping that I can because if I make $665,000, I’ll add that to the 335 I made last year and that will be one million dollars. It will be one million dollars from a starting balance of 583 bucks. That’s my goal. I really would love to do that in two years, to take 500 bucks and turn it into a million dollars in two years would be amazing. That’s my goal, but again, I don’t want to get to fixated on that because that could change the way I trade if I start getting too aggressive or whatever. For right now, I’m just continuing to track for 650,000 this year 660 and hopefully we have a good, strong summer and then we go into a good fall. Usually the fall is good, it’s just a matter of what’s the summer going to hold for us because sometimes summers can be a little slow, but other times they can be strong. They’re not as predictable. Alright, so then BLXL, I didn’t take any trades on this one. It kind of popped up out of nowhere. It just really took off and I just didn’t … I don’t know. 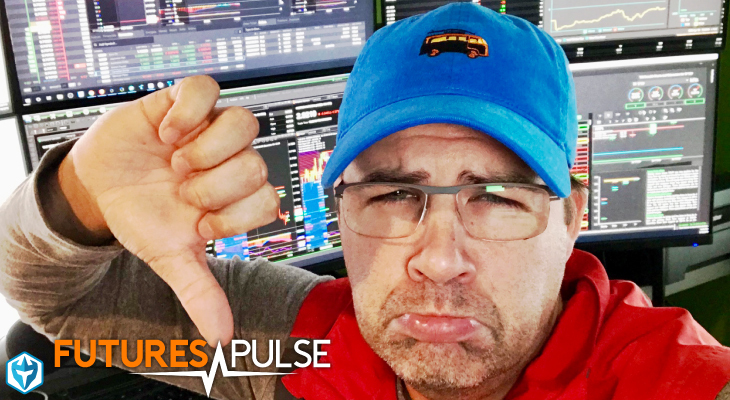 At that point, I was already feeling like I just lost some money on these last couple trades, so I was just like, “No, I don’t want to push my luck.” HEAR, we had it on watch, but it just didn’t really do that much. Anyways, another good day of trading. The account will be up over $150,000 tomorrow, which is awesome and we’re just going to keep trying to stack up those profits and see if we can hit the $100,000 marketing this month. 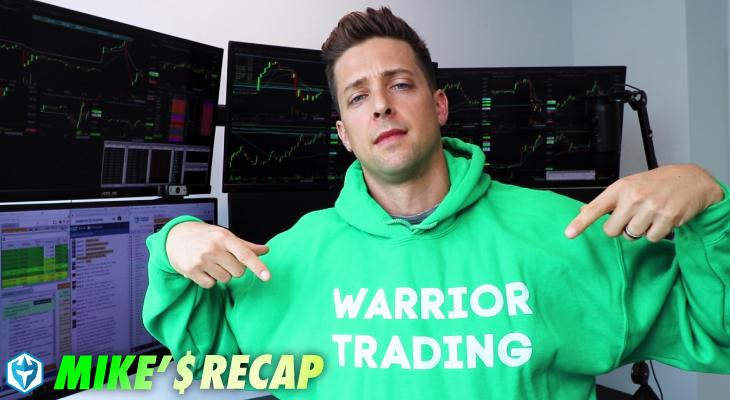 Alright, so that’s the game plan and I will see all of you back here in the chat room first thing tomorrow morning around 9:00-9:15 for our pre-market analysis. Alright, I’ll see you guys in the morning.